interesting project to improve software development of a company. I've been really excited about it and for that reason wanted to remind myself on excellent insights I knew Poppendieck's have. I've read Poppendieck book's before and followed their teachings for some time already. This book had slipped my radar for some reason and I'm actually glad it had. 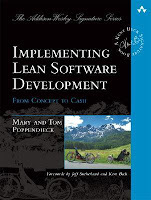 It was really nice to go through thoughts from basics of Lean and Agile software development, without still wasting many pages on those. This book excellently reminds on the basics, but still give valuable information for the more experienced ones. Book is full of excellent examples starting from the 70's and 80's, but coming back to the latest years. It explains all the things shortly, but understandably. It is excellent source for information and ideas for further information seeking. What I've always liked about their thinking, is that they don't ever seem to get in to the hype's. They understand that hype's are hype's and Lean and Agile are something more sustainable. Getting better in software development is never about some specific ways of working. It is always about improvement and doing things better than previously. I don't recommend it to be the first book about Lean or Agile software development. It gives something for everyone, but it is more valuable when one has got more experience to map the information against. It was an excellent book and I enjoyed it enormously. 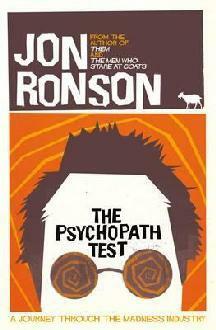 The Psychopath Test by Jon Ronson was addictive dive in the madness industry nowadays. Jon really knows how to grip reader to a journey with many interesting twists. This was the first book I read from Jon Ronson, so I didn't know what to expect. Still I was waiting for more scientific approach to psychopathy, but the book turned out to be really entertaining. Book told a lot about psychopaths, but also about so much else in the whole madness industry. I have to admit I got to know much more about Scientology and mental illnesses from the book that I could have never imagined. The best was, that everything was told in really interesting ways. Jon introduced many persons in the book, some with their own name, some with fake names. He did it so interestingly, that I at least had to go and search for more information about many of these people later on. Maybe suitably for a book about madness industry, book jumps from subject to subject so rapidly, that sometimes it was bit hard to follow. For some other book it would have been annoying, but for madness book, it suits the picture. I can recommend this to everyone who is interested in people and behaviors in general. It explains some of the madness's happening in the world quite well. The worst thing for me reading this book was, that now I must find a book with more scientific information about mental illnesses and psychopathy. 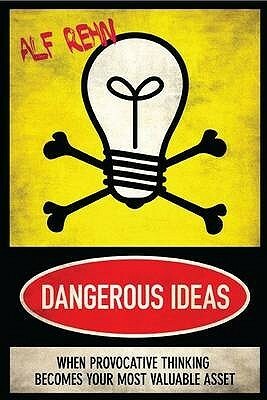 By a coincide I bought Dangerous Ideas by Alf Rehn. I had forgotten book I'm reading to home and I had to go to dentist waiting room that day. I didn't want to go there without any book and I stopped by in a local book store to pick up just some book. There this book was and as I knew the book already I quickly decided to give it a try. I'm glad I did, it was excellent. Due to Alf Rehn being a Finn I had followed his career from media for some time. For some reason it hadn't raised my expectation towards the book. I actually had decided not to read the book. I'm happy I gave it a second change . The book is about creativity. It challenges the whole creativity business and is provocative towards many other things also. That's what I liked in the book. It at least tried to be different from other creativity and innovation books I've read. It made me think differently on many things. Dangerous Ideas was an excellent book for those who have to create new things once in a while. I highly recommend it to everyone. It is provocative enough to hate and love some parts of the book. I'm sure everyone will get something out of it. I got the impression from the book that Alf Rehn wouldn't be always nice guy to work with. My own experience is that best guys to work with are really the ones who are not the nicest and easiest. With the guys who are hard sometimes, I at least have done the best work so far. This is a book I do remember reading for some time in the future. That is what makes a book special for me. P.S I have to admit I read the finnish version: "Vaaralliset Ideat". Book was originally written in Swedish (as that's Alf Rehn's native language) and the Finnish translation was actually quite bad. It used language not suiting well to Finnish language. That's not Alf Rehn fault, but translators. That doesn't concern most of you, but I had to mention for those who can speak Finnish and might think of getting the Finnish version. Last week Marissa Mayer banned working from home at Yahoo. Journalists have taken talked about how Mayer used VPN data to see whether people were working or not. I believe that is irrelevant and only the way to do what she had to do to get company on track. My guess is that Yahoo had grown to be a company full of workers not motivated enough to really make changes. I believe there has been too many workers not committed to make their best. Now Marissa Mayer have given a message to the company: "be committed to a common goal or please leave". Other possibility Marissa Mayer had was to lay off people. Bad thing about laying off people is that, some of the good guys will go with the flush and some of the bad ones will still remain. Now the ones who want to slack, can leave to another company. And them who really want to take part to the future of Yahoo will stay. I believe what Marissa Mayer did is a part of greater plan to get the company back on track. I want to believe it's not really about working from home, but it is about the situation at Yahoo and what had to be done. I know I would have been pissed off by the announcement Marissa Mayer had to do. I know I wouldn't currently, with two small kids, work in a company that wouldn't allow working from home. And to be exact, Yahoo's announcement didn't fully ban working from home, but banned the agreements that people would work from home. Occasional working from home would be allowed, with "best judgement". It's easy to analyse the situation outside and either judge or agree with Mayer's decision. We do not know the truth behind the situation. At least Mayer has made a bold move on something that is not within the standards in the industry. Now we'll wait for the consequences in the future.